Andover, Mass. 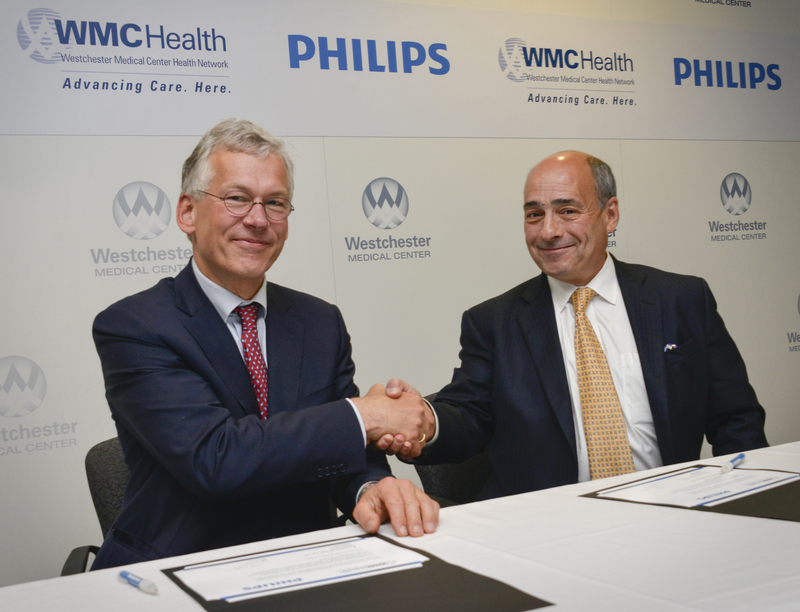 and Valhalla, NY – Royal Philips (NYSE: PHG, AEX: PHIA) and Westchester Medical Center Health Network (WMCHealth) today announced a multi-year, USD 500 million partnership to transform and improve healthcare for millions of patients across New York’s Hudson Valley. The partnership is based on an enterprise managed services model through which Philips will provide WMCHealth with a comprehensive range of clinical and business consulting services, as well as advanced medical technologies such as imaging systems, patient monitoring, telehealth (Philips EICU) and clinical informatics solutions. Moreover, the collaboration aims to redefine how quality care is delivered in all areas, including radiology, cardiology, neurology, oncology and pediatrics, as WMCHealth expands beyond a single-campus academic medical center into a multi-location regional healthcare provider. The partnership is part of WMCHealth’s transformation to a regional network as the largest provider of integrated health in the Hudson Valley. A 1,500-bed health system headquartered in Valhalla, New York, WMCHealth spans seven hospitals and several campuses and locations, along with nearly 300 healthcare partner organizations. Its flagship, Westchester Medical Center, is the only regional resource for complex medical and surgical interventions, covering 6,000 square miles in eight counties and serving more than three million people. The partnership underscores Philips’ commitment to provide new solutions for hospitals and health systems driven by a fundamental shift in U.S. healthcare management towards strategic partnerships for creating long-term patient value, while managing costs, complexity and risk. In similar long-term partnerships with Philips, hospitals have been able to significantly improve radiology volumes and cut MRI waiting times in half. These organizations are seeing a 35 percent reduction in technology spending, while improving clinical quality. A core part of Philips’ managed services model is the focus on continuous improvement through collaboration with key health system partners such as WMCHealth. A joint onsite WMCHealth – Philips team will work to optimize medical technology deployment and IT integration into a unified platform that will enhance WMCHealth’s already impressive operational excellence. With early and ongoing access to the latest Philips innovations in health technology, WMCHealth will be able to maximize the effectiveness of its participation in New York’s Delivery System Reform Incentive Payment (DSRIP) program, aimed at restructuring the healthcare delivery system by reinvesting in the Medicaid program, with the primary goal of reducing avoidable hospital use by 25 percent over five years. WMCHealth is a 1,500-bed healthcare system headquartered in Valhalla, NY, spanning seven hospitals and several campuses and locations in the Hudson Valley. Its flagship, Westchester Medical Center, is the only regional resource for tertiary and quaternary care, covering 6,000 square miles in eight counties and serving more than three million people. WMCHealth employs more than 10,000 people, with nearly 3,000 attending physicians. From Level 1 and Level 2 Trauma Centers, the region’s only children’s hospital, an academic medical center, several community hospitals and numerous health-related centers, programs and services, today WMCHealth is the leading and pre-eminent provider of integrated health in the Hudson Valley..